The Constitution-class U.S.S. Enterprise NCC-1701 was equipped with state-of-the-art weaponary and defensive systems. The phaser is a directed energy weapon that came into general use on Starfleet vessels between 2254 and 2265. Ship's phasers had an effective range of 300,000 kilometers and were used in sublight combat. The USS Enterprise's main phaser banks were located on the lower half of the saucer section. 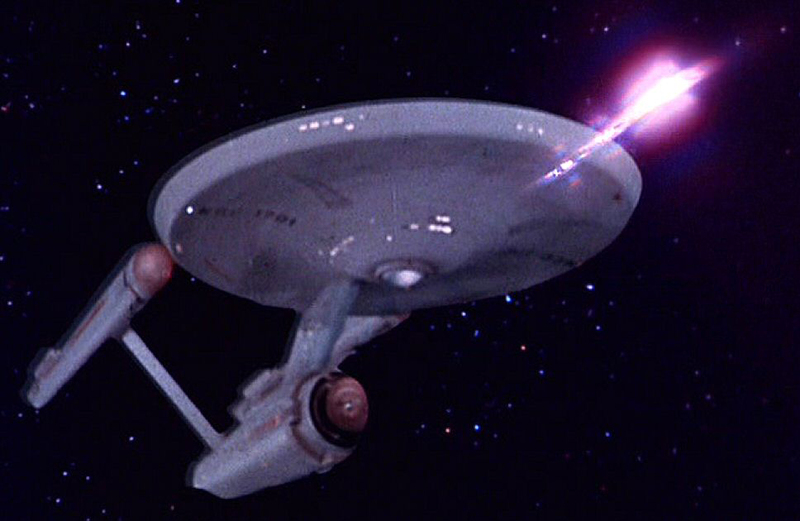 Phasers could be adjusted to different settings: when the ship was in planetary orbit, an experienced operator could use them to stun, heat, or disintegrate objects or beings on the surface. The target area could be as large as a city block or as small as a house. Because they can travel faster than light, photon torpedoes were used when the Enterprise needed to defend itself while traveling at warp speed. 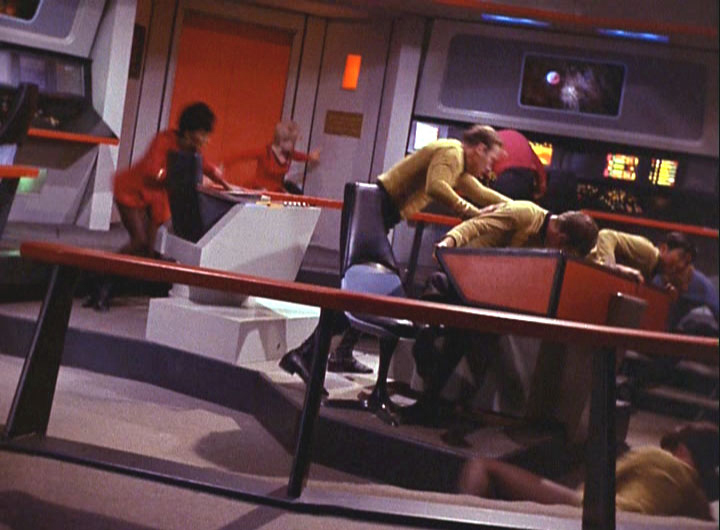 Photon torpedoes gather momentum from their launcher, and their velocity is sustained by a small onboard engine. However, if a warp capable ship reacts quickly enough it can outrun a photon torpedo. Photon torpedoes contain packets of matter and antimatter which are held apart by magnetic seals until forced together to generate an explosion. 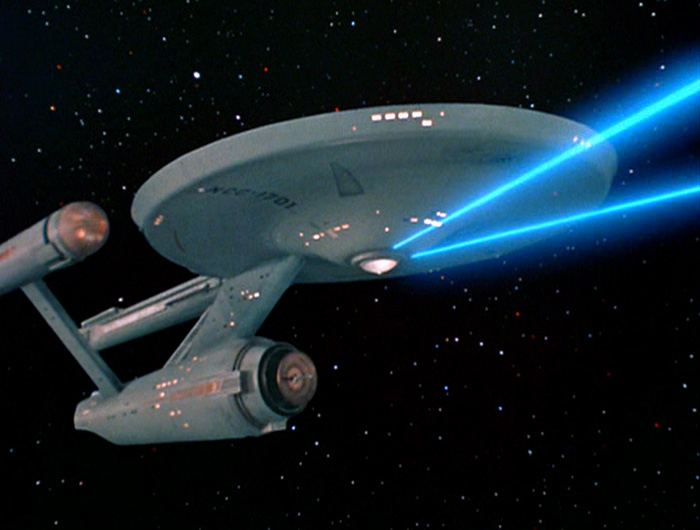 In the 2260s, photon torpedoes were effective only at distances up to 750,000 kilometers. Deflector shields were energy fields used to protect the Enterprise from deliberate attack and dangerous spaceborne debris. Deflector shields can be rised to different levels or strengths. Lower levels can repel space debris; higher levels can protect the ship from enemy weapons. Shield strength is weakened by repeated attacks, but can withstand several phaser or disruptor blasts from enemy vessels. Deflector shields can also be used to prevent beings with primitive technologies from detecting the presence of a ship. The Enterprise was able to extend its shields to protect a smaller ship. 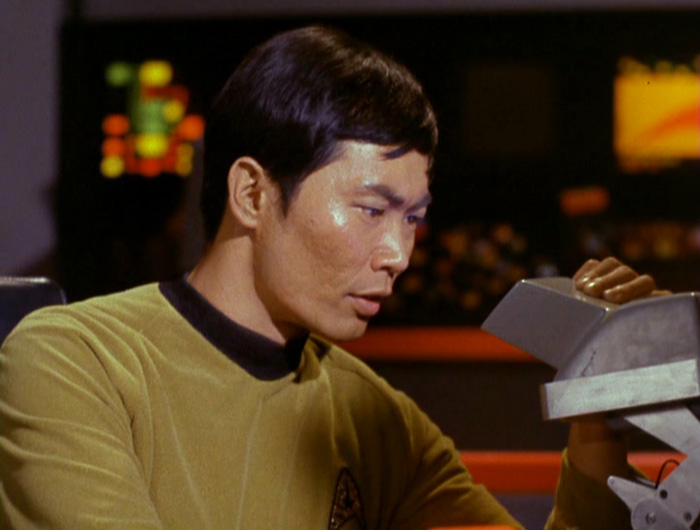 Sensor information was relayed to the ship's computers, which controlled all of the Enterprise's weapons and defensive systems. Tactical functions were divided between several stations on the bridge. The science station provided detailed analysis of any spaceborne objects, allowing personnel to determine their composition and, if relevant, shield strength. The helmsman and navigator could access information about the range of enemy vessels, the likely effects of any weapons fire on the ship, and how much damage had been sustained. "U.S.S. ENTERPRISE NCC-1701" - JULY 1999 ISSUE 3 STAR TREK: THE MAGAZINE COPYRIGHT OF PARAMOUNT PICTURES.